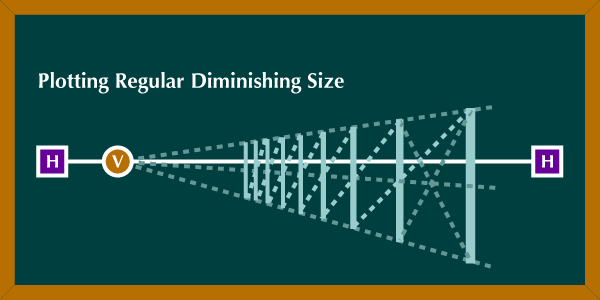 Here is a formula for showing diminishing sizes of planes in a convincing way. Always establish a horizon line and vanishing point before starting. Establish a space in perspective near the foreground in your drawing. Subdivide this space by drawing a line from corner to corner, then repeat the process with the opposite two corners. The point where the diagonal lines intersect will be the center of the space in perspective. From this center point draw a line back to the vanishing point (marked with a "V" in the diagram) to establish a receding center line. Draw a line from the top right corner of your space through a middle point on the vertical line that creates the back of the space and intersects the center line (this point is marked with an orange dot in the diagram) and continue this line until it intersects the bottom convergence line. At this point, where the convergence line meets the construction line, draw a vertical and this becomes the back edge of the next plane adjacent to the previously established one. Repeat steps 1, 2, and 3 as many times as needed to continue diminishing size. One can also plot diminishing size on horizontal adjacent planes by using the top or bottom edge of each vertical plane. The horizontal white line near the bottom of the diagram is merely a horizontal line that intersects with one of the vertical divisions. From these points one can plot the dimishing size of the horizontal planes. 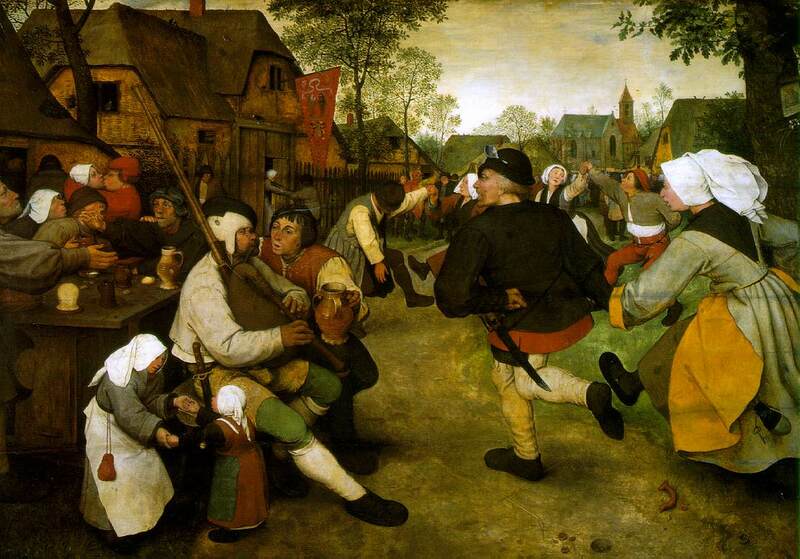 Diminishing size in perspective is shown in Pieter Brueghel the Elder's Peasant Dance done around 1567. You can see the size of areas in the front of the building on the left, then in the picket fence. Since this will appear as a large image in your browser window, you can scroll through the piece to find other specific details.